New Point Comfort – Chesapeake Chapter U.S.L.H.S. 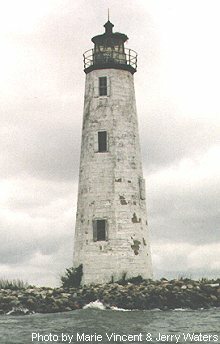 The New Point Comfort light, the third oldest light on the Bay, was built in 1804. It is located at the entrance to Mobjack Bay and the mouth of the York River in Mathews County, Virginia. In 1865 the 63-foot tower was fitted with a new fourth-order Fresnel lens that allowed the light to be visible for 13 miles. The light was automated in 1930. In 1933 a hurricane struck and washed away much of the land around the lighthouse causing it to be stranded on a very small island a few 100 yards from the tip of the mainland. In 1968 the Coast Guard abandoned the station. In 1972 a concerned group of county residents had the light placed on the Virginia Historic Landmarks List. In 1975 the light was deeded to Mathews County. The county, through grants and gifts has done about $125,000 dollars worth of repairs to the tower including the building of a small dock for access. Vandalism continues to be a problem with the light but it can be visited by boat or it is said that one can wade out to the light at low tide but this has not been confirmed.